JA Finance Park is a truly engaging and enriching experience for 8th graders. Joyce Smith, History Teacher, Benjamin Tasker M.S. As a principal, it was awesome engaging with my students and listening to their "aha" moments. I. Michele Johnson, Principal, Benjamin Tasker M.S. The students gain an important understanding of what their parents (and soon themselves) go through in the real world. Jarrod Burbank, Math Teacher, Benjamin Tasker M.S. My students have a new respect for their parents and the financial decisions they have to make....needs versus wants! Tikki Teixeira, Social Studies teacher, Gwynn Park M.S. This exposure allows students to use decision-making skills to plan their future. It is exactly the eye-opening experience they need. Ann Marie, English Teacher, Samuel Ogle M.S. Our visit to JA Finance Park allowed our students to think, believe, dream, and dare. "My experience was not only informative; it was also intriguing, fun, and realistic. I was exposed to many things that i will need to know in order to live a successful life...like budgeting, banking, online banking, the various fields of careers, prioritizing, and a lot of other useful information. It gave me a new level of respect for what adults like my parents have to do. As a matter of fact, as soon as I got home I thanked both of them for doing all of these things for me and the rest of my family. The program gives you the benefit of understanding what it is you need to do in order to reach the goals you've set for yourself." 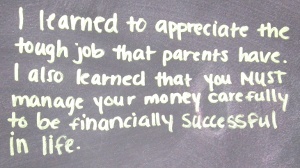 A text message from a JA Finance Park® graduate to her parent following her experience. "[The JA Finance Park] experience definitely made me thankful and realize that being an adult is a lot of responsibility. With my mom being a chaperone, I was able to give her a big hug and made sure I told her thank you. Overall, this experience was definitely one I won’t forget and it gave me a tiny glance into the future. I’ve learned that children really are expensive and that we have the power to control the outcome of our life and not live like our fake scenarios." Hear what these JA Finance Park® Graduates had to say about their experience in the JA Finance Park® Fairfax County Deloitte College & Career Center. Click the images to enlarge. The simulation was nothing like I expected... it exceeded my expectation. I sat at the table with the students who embraced my knowledge and I embraced their enthusiasm. Their takeaway, I hope, was an appreciation for their parents and my takeaway was that the future is bright for these children and I hope I can share in their journey. I’m definitely going to volunteer again! This report describes findings from a national impact evaluation of JA Finance Park® conducted in 2015 by RMC Research Corporation. The first section provides a description of the methodology used to conduct this evaluation. Findings of the implementation portion of the study are presented next, followed by the research findings on program impact. Recommendations are presented following the impact findings. The Appendix contains copies of the instruments used for data collection and technical details on the findings. This document summarizes the final results from a national impact evaluation of JA Finance Park® conducted in 2015 by RMC Research Corporation and the Junior Achievement USA Education Group. Included are the evaluation strategy and protocol, and the results including knowledge gain, attitude change, and other areas of interest.